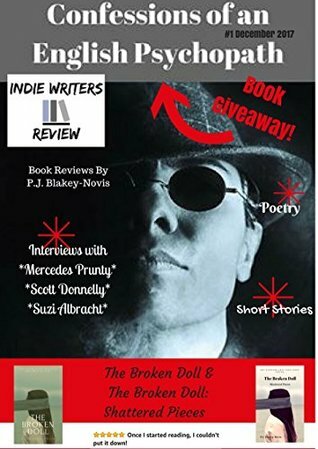 An interesting introduction to Indie Writers Review with a mix of author interviews, short stories and poetry, all by Indie authors. Oh, and don't forget the Indie book reviews. I found it an interesting mix of genres, but then the indie "spectrum" covers a lot of territory (aka genres). The author interviews were detailed and interesting. This is a great magazine full of book excerpts, short reads, book reviews, new release information and general good bookishness. Great 🙂Great e-magazine with interviews, book links, poems, flash fiction and competitions. I enjoyed reading this whilst waiting to pick my kids up from the school run this week. P.J. Blakey-Novis Martin Link Mike Olley Jack Strange Sandy Frediani Kathryn Short Sarah Northwood Linda Crate - Author of The Broken Doll, parts 1 & 2, both released in 2017. Author of 2 collections of short horror stories Tunnels and Embrace the Darkness. Author of a children's book, Grace and Bobo, co-written with his daughter. Editor of Indie Writers Review magazine. P.J. also has a story in Kensington Gore's 12 Days of Christmas anthology, and has had work accepted into two upcoming anthologies.